Battlefields and Warriors: iPad, laptop or desktop, a question of posture. iPad, laptop or desktop, a question of posture. This is my fourth post in a series about trying to replace a laptop with an iPad. The reader may prefer to browse the three earlier posts before reading this, so that the path of my progress with using only the iPad can be put into context. Here is the link for the other three posts. It is now roughly 12 months since I bought my first (and only) iPad. I have an Android phone and so have not really pursued having devices talk to each other. Over that period, I have hardly used the laptop and have even let the anti-virus software subscription run out. In addition to the typical consumption type of activity of web browsing and e-mails etc, I have been running this blog on the tablet, creating a website and putting together maps, game rules and diagrams on the iPad with increasing ease. I am presently working on some game counter artwork (above) on the iPad using the Pro Create app and the SENSU paint brush and so basically the capability side of the machine is not in question for me and I would say that for the most part, if the laptop died tomorrow, I would not replace it with another laptop. Well that seems pretty conclusive ....... well no. Please click on 'Read More' for the rest of this post. As I have said in previous posts, the kit 'needed' by anybody is an individual thing and while I am happy that the 64bit iPad can do mostly all the things that I want, I have been having some physical difficulties with that most natural of things ... age meeting bad posture! Because of the time that I spend staring into a screen, I am having neck and shoulder problems that are worse after sessions with the tablet and I decided that for some of my bigger pieces of work, I needed to sit properly, upright and be looking ahead and that means a desktop monitor (not a laptop - which still causes the head and shoulders to drop forward). But, since my creativity is now so firmly with the iPad, going for a Windows desktop system did not make sense though the Mac stuff is expensive. However, since one way or another the posture had to change and the desktop monitor was the only way to do that, I wanted, if possible a Mac solution. By chance, the latest bunch of Mini Mac's have just been released, with the entry item being £400. 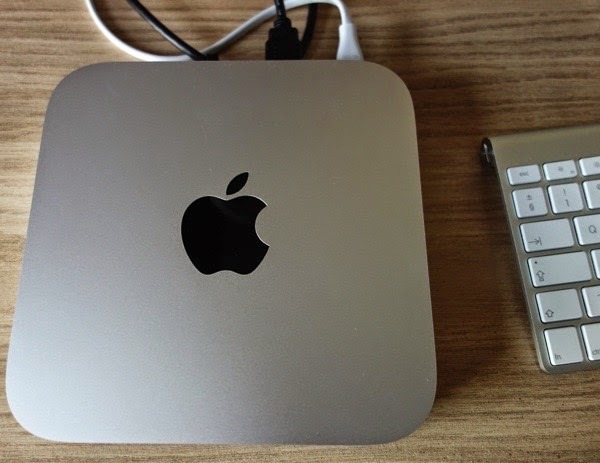 This is a small box that allows you to plug in (or bluetooth) accessories that you may have previously been using with a windows system, so if you have a monitor etc, then this is the gateway into the Mac world for £400. It uses the new 4th Generation i5 dual core processor with 4MB of RAM and 500GB hard drive and shared graphics. There are dearer models that have increased performance in all these regards. The new models have their RAM soldered into position, so you cannot upgrade them post purchase. Despite being dual-core, the new generation has similar performance to older generation of the chip for many tasks. There have been many complaints from ardent Apple fans that the new unit is underpowered and that not being upgradable is a poor decision, but I think the flip side is that the unit has been reduced in price by £100 and that it does provide a bridge for users of other systems to come over into the Mac world. It is a gateway product. Anyway, suffice to say, it has enough power for my needs. It is compatible with the iPad (especially when working on documents in Pages). It gives me the posture change that I need and it sits within a budget to me that otherwise might have made me reluctant to get into a Mac. I have mated the box with a 21.5" HP Pavilion 22xi monitor (via HMDI) and I am using the blue toothed Apple keyboard and also their magic trackpad (though I also have a dongle in the back of the Mac Mini for my Logitech mouse). The trackpad can be used closer to the body so that the arm is not extended to use the mouse, further helping with posture. Interestingly, I am still preferring to use the iPad for artwork and obviously when out and about (I use the small Rapoo keyboard). I also run my web pages from it as my web creation app is tablet specific. So the Mac is just for creating long documents and long web browsing sessions etc. I can use the original Blogger software on it, rather than using a third party iPad App, so that is also helpful. And so in conclusion, It remains the case that over the course of a year I have found that for me, the iPad can replace a laptop and at one time, that would be that, but now creaking bones and longer sessions in front of the screen have made a desktop a compelling buy for me. One will not replace the other. The laptop is somehow squeezed out as being something that falls between these two products. Labels: iPad replacing a laptop? Agreed. And glad you have a solution. I have a standing desk for computing and paining ever since my children could pull themselves up on furniture!